Good news, Fitbit Ionic and Ionic Adidas Edition owners, Fitbit OS 2.0 has landed with the latest software update, bringing a handful of new features to make its smartwatches a bit more, well, smart. The update, which will also be available on the Versa when it lands in April, has just started to roll out with an emphasis on bringing more data to the wrist and making it easier to use the Fitbit watches. You can install OS 2.0 either via the Fitbit web dashboard, or using the Fitbit companion app on your smartphone. To find out the software version currently running on your device, look for the account icon in the top right corner of the smartphone app, or the settings icon cog on the web dashboard. If the update is available, you should see a prompt flash up at the top of the dashboard. Based on our experience updating the Ionic and Ionic Adidas, you'll need to put aside at least 30 minutes to make the transition to OS 2.0. So it's perhaps not one to initiate when you're on your way to work. Doing the update over Wi-Fi is definitely recommended too. We've been playing around with the latest Fitbit software update in order to find out what new features you can expect and what we've actually found useful so far – read on below for all the info. This is perhaps the biggest thing that most Fitbit Ionic users will notice when they get the update up and running. Fitbit wanted to give us more data and this is what Fitbit Today is all about. The new dashboard can be accessed by swiping up on the main watch screen. Here you'll now be able to view steps, distance, calories and activity minutes. Swipe down and you can view steps completed for the hour and whether you've hit your step goals by the hour. The last section displays your current and resting heart rate data, along with a reading of your average resting heart rate data. If you want to know why it's useful seeing this information, have a look at our breakdown of the benefits of monitoring your resting heart rate. There's also another aspect to Today and that's the Tips and Tricks and Inspiration features. The idea is that, along with your data, it'll provide personalised messages reminding you to do things like regularly drink water during the day. If you're not interested in these features, you can turn them off in the Settings menu, which you can find by scrolling down to the bottom of the Today dashboard. Until now, only Ionic users in the US had the ability to download playlists from a music streaming service (Pandora), which could be synced to the smartwatch so you can listen to them offline. It's similar to what Apple offers with Apple Music and the Apple Watch, and the tie-up Spotify has with Samsung for the likes of the Gear Sport and the Gear Fit2. Now Ionic (and soon, Versa) owners outside of the US will be able to do something similar with Deezer's music streaming service. On the watch, simply look for the Deezer app icon and tap it to reveal a prompt to head to fitbit.com/deezer along with an activation code. From there you can either link an existing Deezer account or set up a new one and you'll get three free months to try out the Premium service. You'll need the premium service to be able to access the offline support by the way. Also be aware that this is a free subscription service that does require handing over your payment details. So if you don't cancel in that three months, you will start getting charged. Handy hint: do what we did and set yourself a calendar reminder, just in case you don't fancy paying up long term. 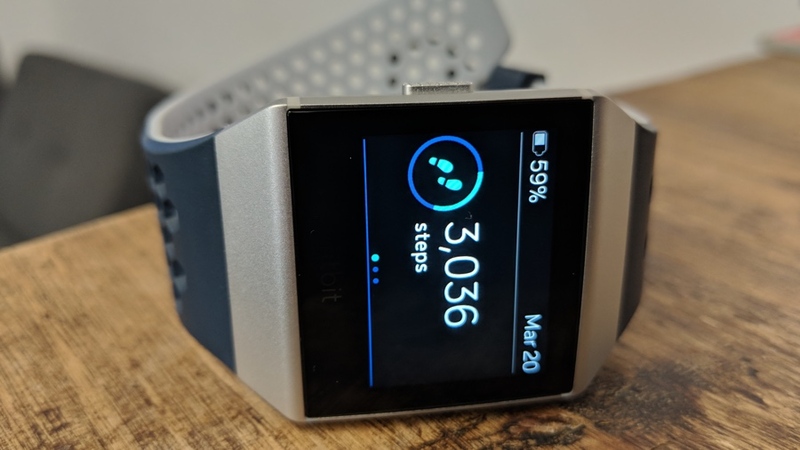 Fitbit wants to help make it easier to get to the features you use on the regular, so with OS 2.0 it's added a bunch of shortcuts using the physical buttons on the Ionic and the Versa. Here's what you're getting. Pressing and holding the button on the left hand side of your Fitbit smartwatch from any screen will give you access to music player controls as well as settings to control whether you want to receive notifications or keep the screen awake. We've found these quick access controls a nice addition when you're out for a run, and is a lot like a similar feature on the Garmin Forerunner 645 Music sports watch. If you like the idea of being able to quickly set up an alarm, you can press the bottom button on the right hand side of the watch to open the relevant screen. If you want to go alarm crazy, you can set up a maximum of eight at a time. For those who want to get to sports tracking, press the top right button on your Fitbit smartwatch and it'll push you straight into the Exercise screen ready for you to pick your activity. Have you spotted anything new and useful on Fitbit OS 2.0? Let us know in the comments section below. Great spot. We'll add that in and give you a mention too!